Get out your knitting needles! 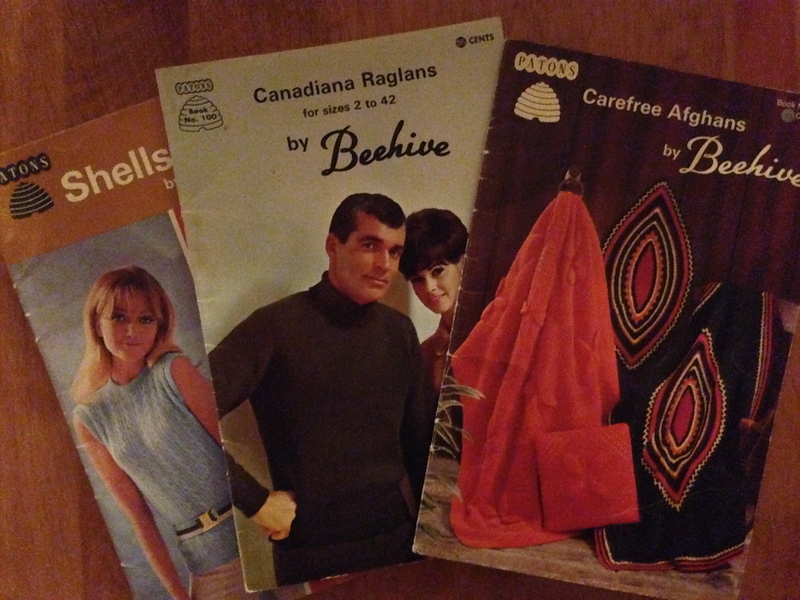 A while back I wrote a post (which is here, if you’re interested) about a very entertaining find I made at the used-books-for-sale cart at the Tweed Public Library: to wit, a couple of vintage booklets containing instructions and patterns to create macramé delights. And I am talking delights, people! Why, with those instructions you could macramé yourself a hanging-plant holder, or a lampshade, or even a wine rack! (I am not making this up.) And if you happened to do such a thing today, and installed your creation in your home, you would instantly create a mid-1970s time warp. All good clean fun, if you ask me. Not that I’m quite prepared to try it at the Manse. What a flashback! That same booklet had sat for years around the very house where I am writing this post – the Manse, of course, in Queensborough – back in the early 1970s, when my mum, Lorna, had (along with much of the rest of the female population of North America) taken up knitting such things as “carefree afghans.” To take advantage of that knitting craze – a wave that seems to crest every 20 or 25 years, in my experience, not that I’ve ever been much more than a very casual surfer on it – the good folks at Patons, makers of Beehive yarns (100-per-cent artificial fibres, as I recall) produced booklets of instructions like this. 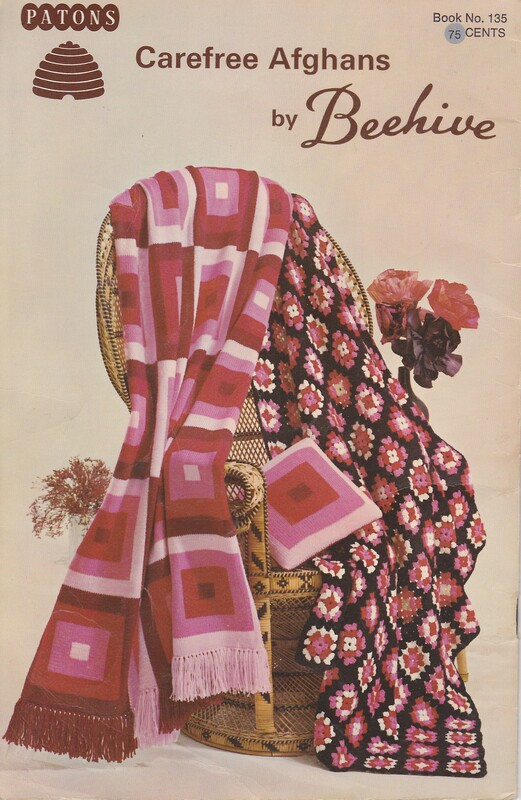 There were probably quite a few booklets of afghan patterns out there, but the instant I spotted this one I knew that it was the one my mum had used here at the Manse. Okay, let’s take a brief pause and ask the obvious question: why were those knitted blankets, or throws, or whatever we might call them now, called “afghans,” do you suppose? I leave that to the wisdom of the readership to answer. It’s the one with the mod squares in pink, plum, red and scarlet, the very colours Mum used for her second go at that afghan; her first one was in various shades of green. “Toned Tiles,” this carefree afghan is called in the Patons book. 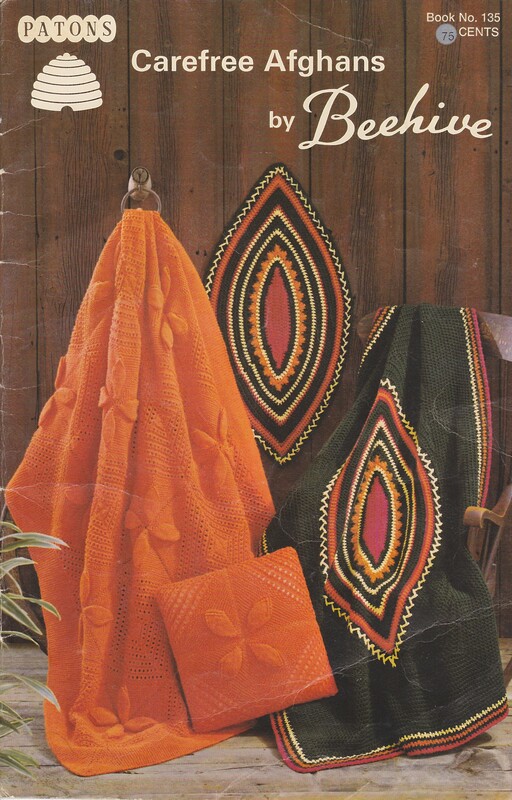 “Designed for the modern living room or recreation room,” it says in the introduction to the knitting instructions. Both Mum’s red and green “Toned Tiles” afghans were well-loved and well-used in our “modern living room” – notably for keeping knees warm while watching Hockey Night in Canada on the telly – for many, many years; those Patons 100-per-cent-artificial-fibres yarns were pretty much indestructible, even in a family with four rambunctious children. And in fact, the green Toned Tiles afghan is, Melanie informed us last night, still extant and in occasional use up at the home at the Sedgwick family farm in Haliburton County. More than 40 years after it was knitted! Talk about a carefree afghan built to last. I suspect it needs to find a permanent home at the Manse – where that pattern was carefully followed by a very busy young mother, all those years ago. 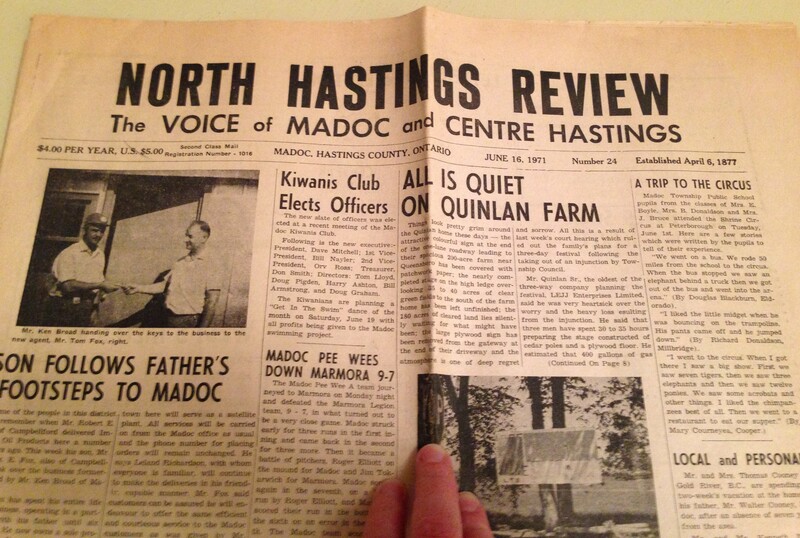 The North Hastings Review issue of June 16, 1971. I don’t know if I’ve ever enjoyed reading a newspaper as much as I enjoyed reading this one. A wondrous thing arrived in the mailbox here at the Manse the other day. 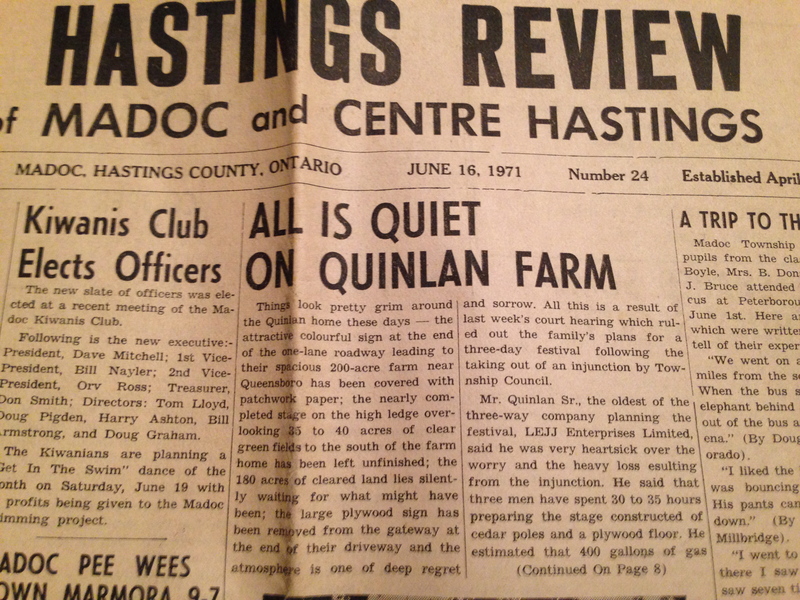 It was a copy of a now-defunct weekly newspaper: the North Hastings Review, issue of June 16, 1971. Its arrival was easily the best thing that’s happened to me so far in 2015. You’re thinking I’m addled, aren’t you? You’re wondering: How on earth could a 44-year-old copy of a tiny and long-gone newspaper be such a thrill to that Manse woman? Anyway, I am pretty sure that the reason Ken had held on to this particular copy of the North Hastings Review – which was published in nearby (to Queensborough, I mean) Madoc, and later became the Madoc Review before it became nothing at all (sometime in the late 1980s or early 1990s, I believe) – was that there was a story about him right there on the front page. He had just sold his fuel-delivery business to Tom Fox of Campbellford – a familiar name in this area – and there is a story about the change in ownership, and a photo of the two men, right there at top left of Page 1. In a brief note he sent along with the paper, Ken said that his father (a remarkable person whom many people called “The Major” due to his distinguished service in both the First and Second World Wars – but that’s a whole other story, and a great one) used to call the North Hastings Review “the 7-7-7 paper: 7 days to print, 7 cents to buy and 7 seconds to read.” Oh lord – as the former editor of another small-town newspaper, the Port Hope (Ont.) Evening Guide, I am very familiar with readers’ joking comments about how one could throw our modest little daily paper up in the air and read it on the way down. But you know what? Behind the joking, people loved and (more to the point) needed that paper, that daily report on what was going on in their own community. And I am totally certain that The Major and all the other readers of the North Hastings Review also very much appreciated its community reporting, even while they made gentle jokes at its expense. Anyway, I must tell you that, as I told Ken in my email of thanks to him, it took me a lot longer than seven seconds to read that paper. With the exception of the small print in some of the classified ads, I read every single word. And all of it was an utter joy. This is a front page with a lot of local news. And so many of the names are familiar! One: this was the local news from what I consider my time. On June 16, 1971, I was about to turn 11 years old. My family had been living at the Manse in Queensborough for seven years, and we would live there for four more. We were deeply embedded in the Queensborough-Madoc-Eldorado-Cooper area, and because my father was the local United Church minister, we had contacts and friendships with many, many families in that area. The people who are mentioned in the pages of this issue of the North Hastings Review are people I knew (and in some cases still know) – everyone from teachers and fellow students at Madoc Township Public School (where I would have just been finishing Grade 6 in June 1971) and Madoc Public School (where the following September I would start Grade 7), to players on the local minor-sports teams whose games are reported, to the ministers of the local churches cited in the long column of notices for church services, to the mother and father of the bride in a delightful report on a wedding that my father had conducted. 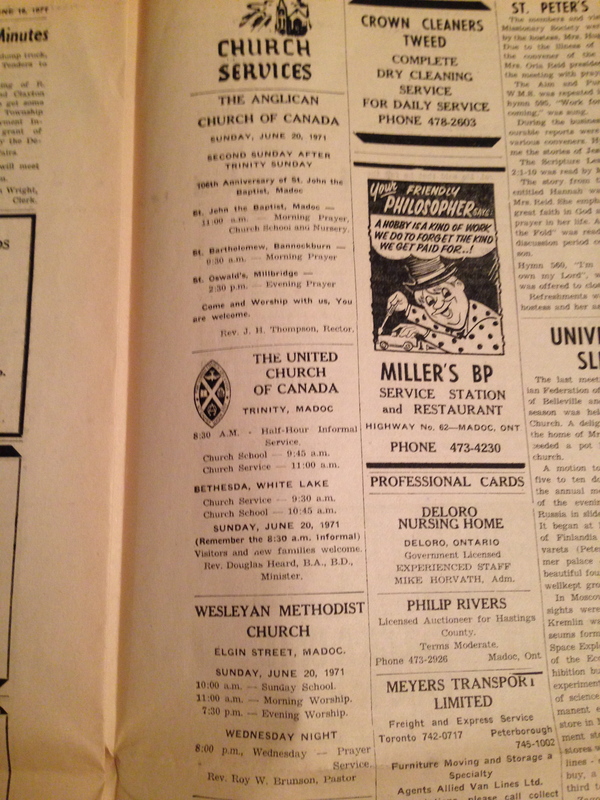 Some of the church ads (people actually went to church in 1971!) in the North Hastings Review. And two: This newspaper is great journalism. And no, I am not trying to be funny. The North Hastings Review is chock-full of local news, and providing local news is what local newspapers are supposed to do. When you’d finished reading it, you really knew what was going on in the local area – from who had dined with whom the previous Sunday in Cooper and who had visited whom in Bannockburn; to who was the winning pitcher (as it happens, the late Lorna Matthews, a wonderful person who was the church pianist at St. Andrew’s United Church in Queensborough for many years) when the Cooper women’s softball team defeated the “Madoc Ladies” 24 to 7; to who gave a demonstration on refinishing furniture at a meeting of the senior citizens’ club; to where local school groups had gone for their end-of-year excursions (Sainte-Marie Among the Hurons and the Shrine Circus in Peterborough; the reports, which appeared on the front page, were written by some of the students themselves, and I can only imagine how proud their parents must have been); to what was on sale that week at George West’s Men’s Wear. The major story of the week: the latest news on the Rock Acres Peace Festival, which had been planned for the Quinlan farm near Queensborough – or “Queensboro,” as the Review spelled it. You got the big stories – an in-depth report on what at that point looked like the defeat of the plans to hold the aforementioned Rock Acres Peace Festival on the Quinlan farm outside of Queensborough; in fact, the Quinlan family later won the legal battle against the local authorities, the festival went ahead, and you can read all about that here and here and here and here. Everything you might have needed to know that week about what was going on in the hamlets of Bannockburn and Gilmour. Good stuff! A letter to the editor from Grant Ketcheson, comparing the farming life in Scotland to that in the Madoc area. Good stuff! But there’s more! 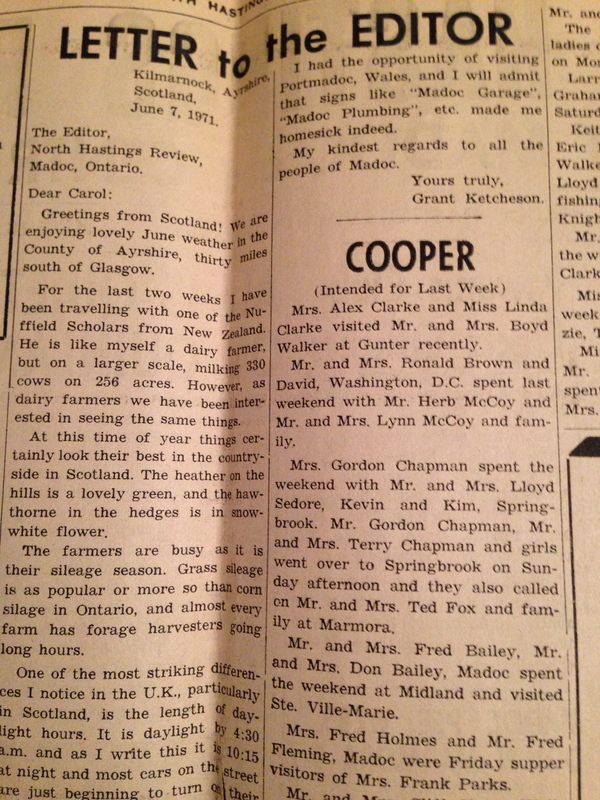 There’s a letter to the editor from a young whippersnapper farmer from the Hazzard’s Corners area named Grant Ketcheson (still a great friend to this day), who was visiting Scotland on an agricultural scholarship and sent a lively report on farming practices (and weather) there as compared to the Madoc area. There’s the report on that wedding conducted by my father, complete with the extraordinarily detailed description of the wedding dress that those reports always had: “The bride was lovely in a full length taffeta gown highlighted with a dainty lace trim around the scoop neckline, down the full-length sleeves and around the full skirt. The bodice and sleeves also featured rose appliques and her long full train with matching lace trim was attached at the waist with a large bow. The three-tiered bouffant veil was gathered to a circle of dainty white orange blossoms and seed pearls, leaving the centre open for flocks of curls. She carried a cascade bouquet of yellow daisies.” (And if you want to know what the mother of the bride and the mother of the groom wore at the reception, you’ll just have to get you hands on your own copy of the paper.) There’s a column by Bill Smiley, who was omnipresent in small Canadian weekly newspapers back in those days. It was delightful to see the late Mr. Smiley’s byline again after all these years. And there are the ads for businesses that bring back such good memories: George West’s, as I mentioned; Wilson’s (which only recently closed down after many years in business; I wrote about that here); Johnston’s Pharmacy (still going after all these years; that too is reported on in this post); the long-gone and much-missed Plaza cinema in Marmora (I saw my very first movie there! ); and (ta-da!) the Cash & Carry! 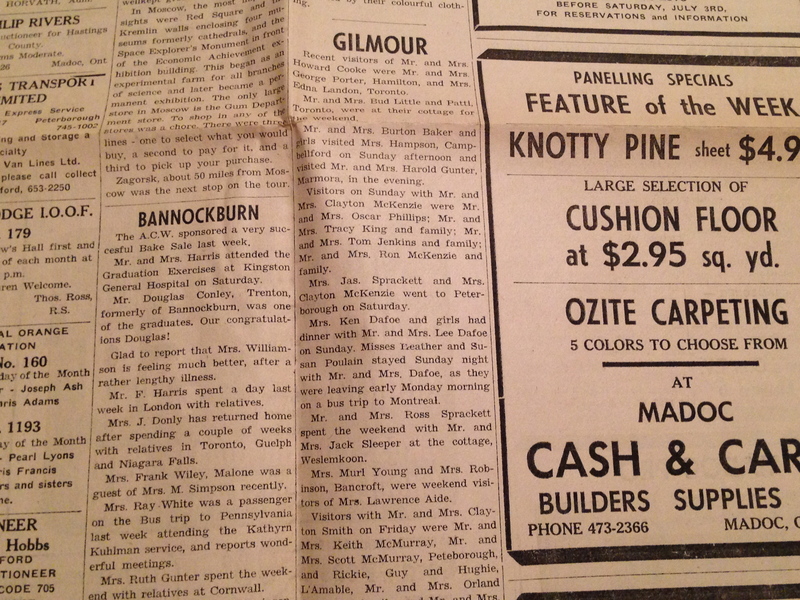 Which was having a sale that week on wood panelling. I’d almost be willing to bet my bottom dollar that the wood panelling that got put up in the Manse kitchen during my family’s tenure here – about which we were so excited at the time, because wood panelling was so fashionable; and which Raymond and I are now very keen to get rid of, because, let’s face it, it’s awful – might have come from that very sale at the Cash & Carry down there on St. Lawrence Street East in downtown Madoc. It is community journalism at its very best. I know that Ken Broad knew I would appreciate having a chance to go through that paper, but I bet he didn’t guess just how much I’d appreciate it. 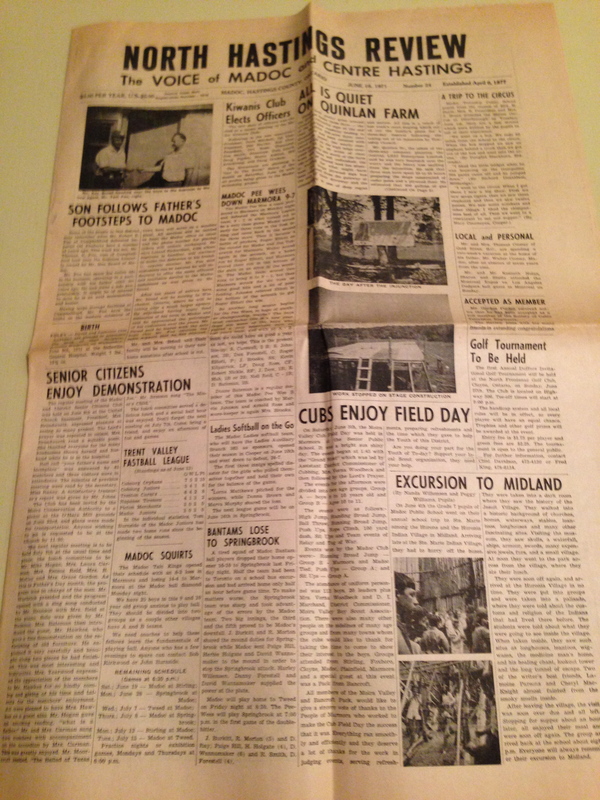 Such wonderful, wonderful memories, all thanks to a terrific community newspaper. And a person who had the excellent good sense to preserve it – and the kindness to share it. 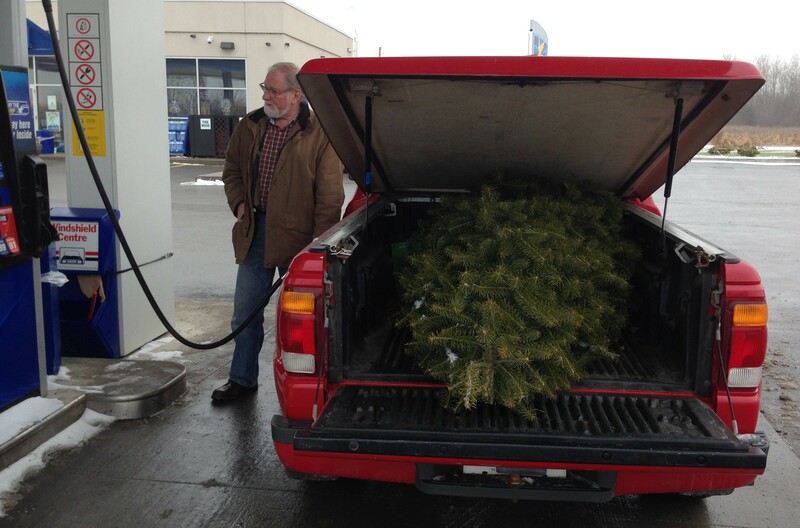 My very handsome husband, Raymond, filling up his little red truck (complete with newly purchased Christmas tree) at gas prices that were below $1 a litre for the first time in years. Yay! So I don’t know about you, folks, but here’s what everyone I know is talking about: low gas prices! I guess the somewhat discouraging thing about this otherwise delightful state of affairs is how incredibly dependent we are on gasoline to get through our daily lives. Way more so here in the new life that Raymond and I now lead in Queensborough than when we were living and working in the big city of Montreal. Posted gas prices at less than $1 a litre: a nice Christmas gift for rural Ontarians who pretty much have to drive everywhere they go. I mean, people will grumble about high gas prices wherever they happen to be, and when they’re almost $1.50 a litre in Montreal all drivers, and certainly all cab drivers, are crabby. But in Montreal lots of people take public transit, and are thus far less affected by gas prices than are drivers. In addition, even if you choose to drive around the city, chances are good (unless you’re a cab driver) that you’re not travelling anywhere near the distances that the average rural Eastern Ontario driver covers in a day, or a week. When you live in Queensborough and have to travel at least eight or nine miles to do almost anything – buy milk or bread, go to school or work, get your hair “done” (now I’m seriously dating myself, though please don’t think that I get my hair “done” – that was my mum’s generation) or go to the dump – well, you burn a lot of gas. And the even sadder part is that, things being what they are, these days you really couldn’t live in Queensborough, eight or nine miles from all services, if you didn’t drive. Bring back our general stores, I say! But anyway. 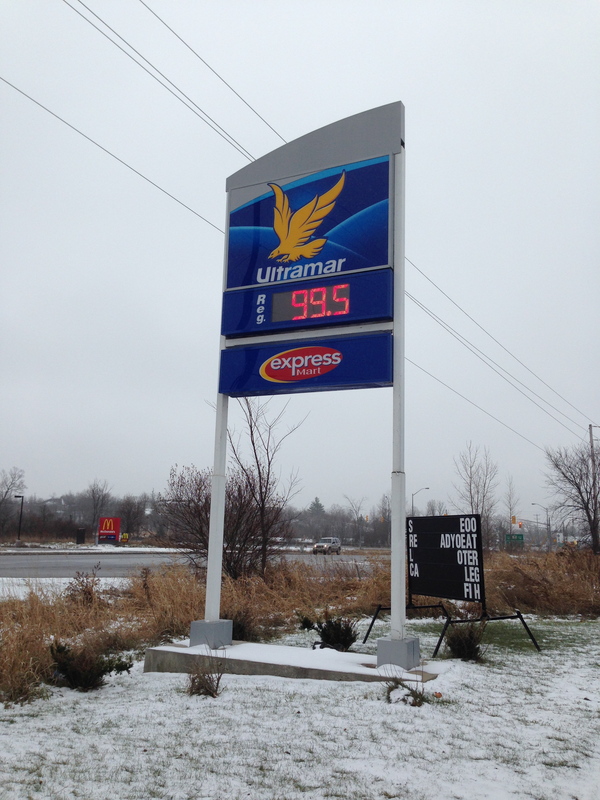 Tonight I just wanted to share the news that the gas prices are making us all here in rural Ontario quite happy. “In Oshawa it’s 92!” shouted a woman to a total stranger at a gas bar in Port Hope where Raymond and I happened this morning, as the two of them both did a little happy dance about filling up at 97 cents a litre there. And I had to smile at the chap I spotted at the Ultramar in Madoc who, when the price had gone down to 99¢ a couple of days ago, was filling up not only his vehicle but, obviously, every gas can, old and new, that he’d been able to rustle up from around his property. Well, the reality of rural-Ontario life in 2014 is, as I’ve said, that you have to drive. In an ideal world that won’t be the case; there will be not only transportation support and services available for non-car-owners, but also the ability to buy food and other necessities right where you live, just like we used to be able to do in the good old days of my childhood here. But we’re not in that ideal world just yet, and so: Merry Low Gas Prices, everyone! Our 2014 Christmas tree, a lovely tall balsam. I hope longtime readers will also appreciate the curtains in our living room – the very same ones that adorned those old windows back in the 1960s when I was growing up here! 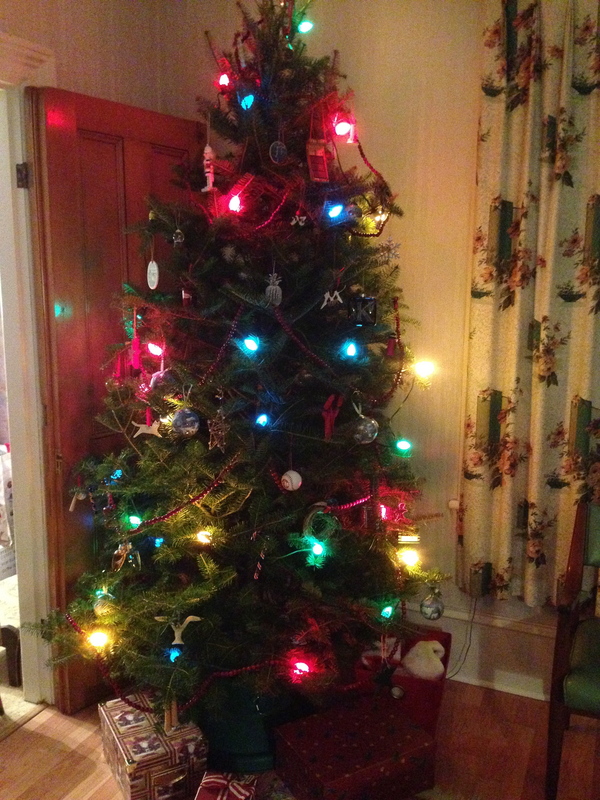 It’s been a busy, busy day, my friends, and I am weary; and so I am going to write a very brief post – featuring little more than a photo of the 2014 Manse Christmas tree, erected today. It’s a beautiful fresh balsam that makes the house smell good and Sieste the cat mildly curious. And as of just a few minutes ago, when Raymond and I finished the job, it is decorated with all the ornaments we have collected over years of travelling and seeking out decorations that will remind us of the places we’ve been. There’s a miniature lobster trap from Maine, a little toboggan from Montreal, a string of ceramic garlic found on Beacon Hill in Boston, a bright red cardinal from Port Hope, Ont., a miniature ceramic tuxedo cat (like Sieste) from Burlington, Vt., and even a lone star from Galveston, Tex. Every ornament tells a story! But the best part is that the place where they’re telling their stories is right here at the Manse, our cozy home in perfect-Christmas-village Queensborough, which as of this evening – what with all the decorating and ornaments pulled out of storage and whatnot – is just one Christmassy house, let me tell you. And appropriately, the Christmas tree is, as always, right in the same corner where it (almost) always used to be when I was a kid growing up in this very same Manse. Other candidates listen as school-board-trustee incumbent Thelma Goodfellow answers a question. 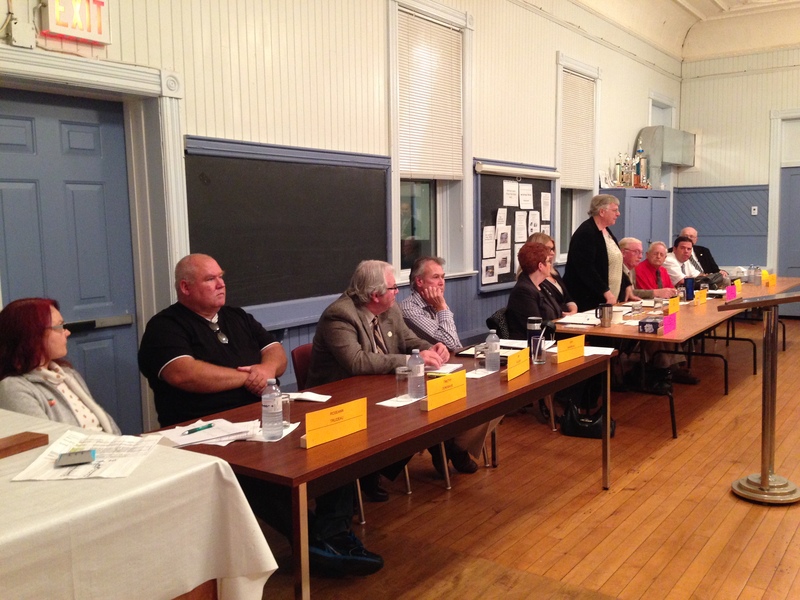 They are, from left: Roseann Trudeau, Timothy Donoghue, Jim Flieler and Don DeGenova (all seeking councillor seats), Linda Akey (running for deputy mayor), Kali Meeks (councillor), Brian Treanor (deputy mayor), Fearnley Davies and Jamie DeMarsh (councillor) and Larry Whitfield (school board). Well, it’s almost past my bedtime, folks, but I can’t retire without giving you a report on this evening’s all-candidates meeting in Queensborough. All of those seeking election (or re-election) for Municipality of Tweed council and public school-board positions in the Oct. 27 municipal vote had been invited to appear, and sure enough, all of them showed up at the venue, the Queensborough Community Centre – our historic former one-room schoolhouse. (Incumbent Mayor Jo-Anne Albert was not invited since she has been acclaimed for another term, having been unopposed.) 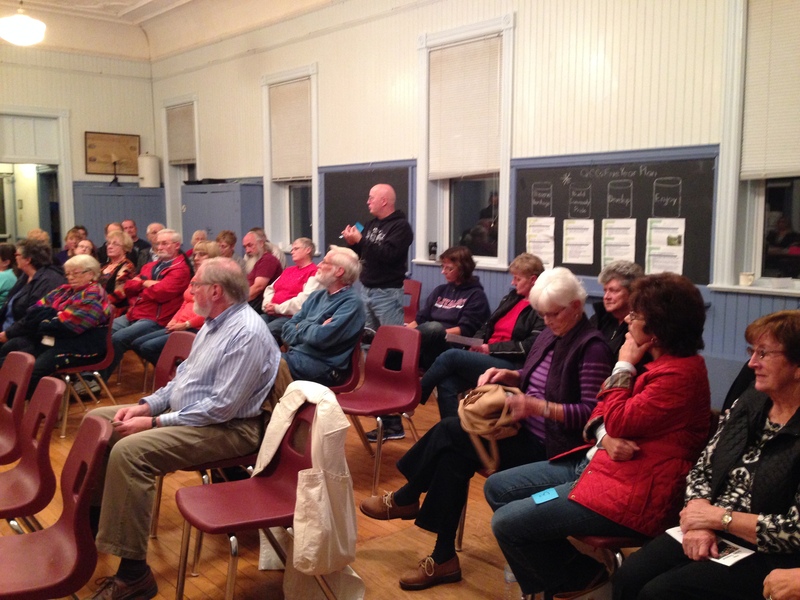 As for the audience, there was a very respectable turnout, people not just from Queensborough but from other parts of the Greater Tweed Area (as well as some interested visitors from next-door Madoc Township). It had been a long time since I attended an all-candidates meeting for a municipal election; the last time would have been sometime during my career as a reporter for the tiny Port Hope (Ont.) Evening Guide daily newspaper, way back in the 1990s. And Raymond? As far as he can recall, it was a first. So that was kind of cool. It was a well-run (by our neighbour Brian MacNeil, who ably served as moderator) and largely low-key affair, with the candidates making brief statements to start and then questions invited from the audience. As you would surely expect, the issues raised were very local ones, and that’s just as it should be; the whole point of municipal governments is that they represent people at the strictly local level. I suspect I was not the only one in the crowd who was a little disappointed not to hear more about Queensborough per se from the candidates in their opening speeches; two or three made mention of our little hamlet, but it didn’t go much farther than that. Overall their focus seemed to be on issues that affect the village of Tweed, as opposed to the Municipality of Tweed – a much larger geographical entity encompassing vast rural, and even wilderness, areas as well as several hamlets like Queensborough. I was pleased to see that audience members smartly turned the candidates’ attention to issues closer to us than how urban Tweed deals with its too-low sewage-capacity situation. People, out here we are in septic-tank territory, and our only real concern about whether the village of Tweed gets a new sewage lagoon or a full waste-treatment plant is how much it will affect our property taxes. An attentive crowd listens as a question gets posed to the candidates. So yeah, the Queensborough folks raised Queensborough issues, and that was great. Issues like road plowing, and school-bus stops, and the lack of garbage and recycling pickup, and an issue that is really close to my heart: the lack of reasonably-priced and reliable high-speed internet here. (There was much applause and general agreement whenever that issue got raised; I was happy to see such clear proof that others care about our execrable internet situation as much as I do.) The candidates were asked about deterioration of the bridge leading into the hamlet from the east, and why some of the popular summer Music in the Park events in Tweed can’t be held in the park in Queensborough. Some excellent suggestions were made (from both the audience and the candidates), including designating a geographical area of responsibility for each council member, so that each area’s interests and concerns would have a champion at the council table; doing more to celebrate and promote this area’s aboriginal and French Canadian heritage; establishing a municipal composting program, with the compost sold back to residents for use in their gardens; more support for beautification programs; instituting a buy-local policy for the municipality; and so on. It was the farthest thing from slick politics. It was down-home politics, the candidates getting close to the people they want to represent and the people getting a close-up look at those candidates and their positions. And at the end there was an opportunity for one-on-one conversations over coffee and tea. As Raymond and I walked back to the Manse through a very autumn-like chilly and rainy night, we agreed that it had been interesting and eye-opening. We both came away with changed minds on some of the people we plan to vote for. Which means that the all-candidates night accomplished exactly what it should have: educating us voters about the issues and the candidates. And as Moderator MacNeil said, in the perfect ending to the evening: Now it’s up to all of us to get out there and vote! 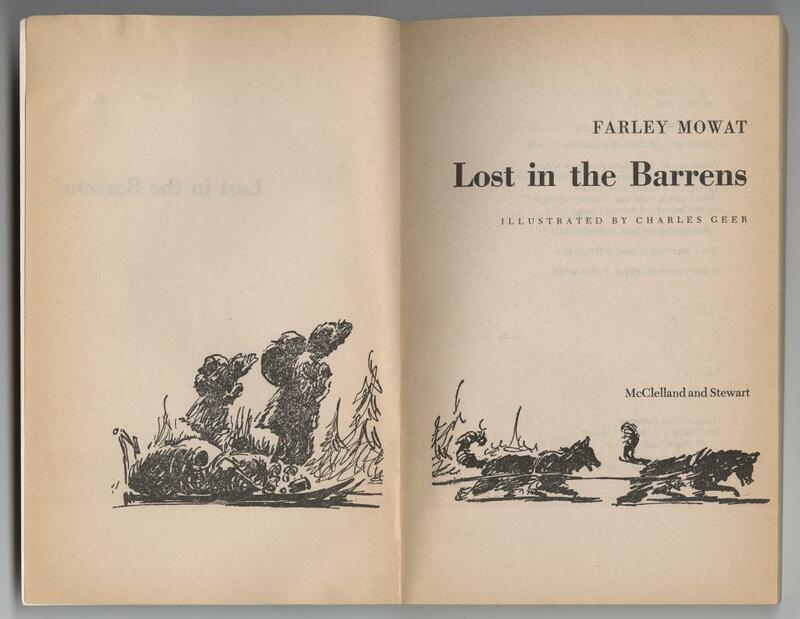 In the days when I was a kid growing up here at the Manse in Queensborough, Farley Mowat was – as he remained until his death last week at the age of 92 – very famous indeed. 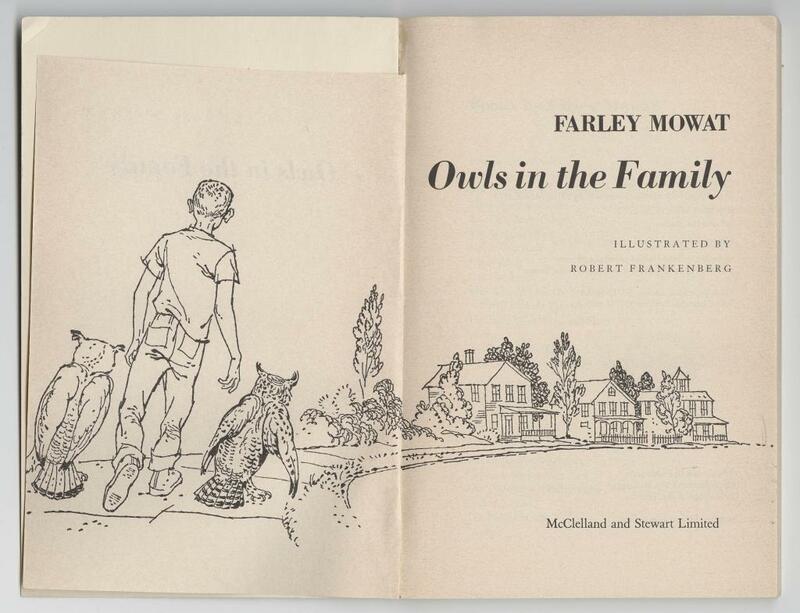 We read a lot of his books in school (that would be Madoc Township Public School), and I vividly remember my heart being in my mouth over the adventures in Lost in the Barrens, and the whole class laughing as a teacher read us Owls in the Family. I also recall a TV ad that I must have seen hundreds of times on the Manse’s old black-and-white set. Does anyone else remember it? There were Farley and one or two of his dogs – Labs, I think – kind of wrestling on the floor as he told it (them?) a yarn. All day I’ve been trying to think what the ad was for; it finally came to me just now, as in my head I heard him once again roaring the punchline: “It was the Ontario Humane Society!” And of course, Farley being a well-known animal-lover, it would have made perfect sense that he’d support that organization in that way. I’d hoped to find the ad itself on YouTube to show you (and refresh the memories of those who are, like myself, of a certain vintage) but sadly it does not seem to be there. I’m pretty sure it ran on the CBC; perhaps that organization will eventually dig it up in its archives. Anyway, I must also tell you that I came to know Farley and his wife, Claire, in later life. As a young reporter and editor I lived and worked for many years in Port Hope, Ont., where the Mowats also resided when they were not in Cape Breton. I hadn’t known that these famous people lived there when I moved to Port Hope, and I can still recall the rather thrilled shock I experienced one evening very early in my career when, as I was doing some research on plans for an annual canoe and kayak race down Port Hope’s Ganaraska River (poetically called Float Your Fanny Down the Ganny), the chief organizer mentioned casually that “Farley” would be on hand for the event. “Do you mean Farley Mowat?” I asked. Wow. And there Farley was on the day in question, and I subsequently attended many a public and private function in Port Hope that the Mowats were at. Farley was pretty much always the life of the party, and people of course gathered round him to see what outrageous and funny thing he might come out with. And Claire was (and is) always just lovely, kind and soft-spoken – and also, in case you didn’t know, a very talented author in her own right. Farley lived such a long and productive life. He never stopped reminding us to treat the animals well and to stop wrecking our environment. Those are important messages for us all today, even as they were way back in the 1960s and ’70s, to a star-struck young fan in Queensborough. I think the Manse needs a conservatory. Doesn’t every house need a room like this? Perhaps especially the Manse? I can’t remember the first time I was ever in a conservatory; it could well have been somewhere in England, in a country hotel, perhaps; or maybe in one of the fine and beautifully restored Victorian homes that Port Hope, Ont. (where I was a newspaper reporter and editor for many years), is known for. 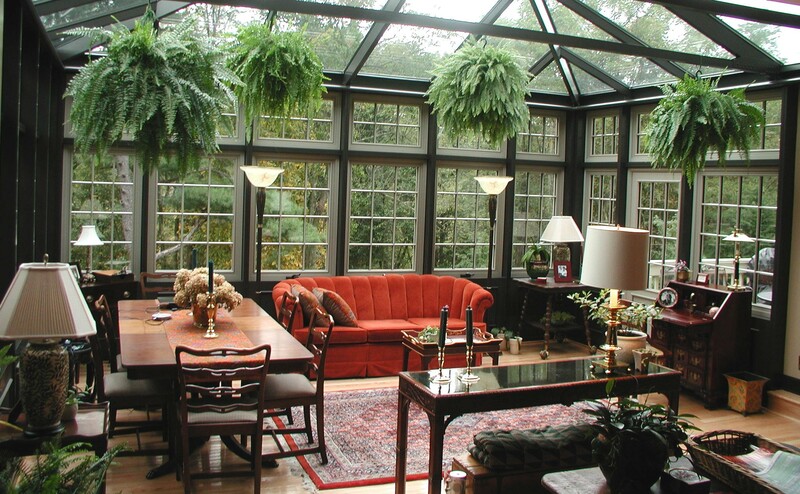 At any rate, I am quite sure I Ioved the idea of a conservatory long before I was ever in one. And once I’d been in one or two, I loved the idea even more. Right. So. I think the Manse needs a conservatory, even if Raymond and I aren’t necessarily wealthy landowners who will be cultivating citrus fruits there. And did I mention that we have just the room for the purpose? Ahhhh. I am dreaming. Swooning, actually. But come on, we all just need to use a little imagination! The back porch/summer kitchen has a interesting roof structure that could look cool atop a conservatory. We could replace the frame walls with a lot more windows, and make them floor to ceiling. Maybe we could even do something with the old chimney that you can see in one of the photos, and have a great fireplace in the room. And wouldn’t the rear brick wall of the main part of the house look great as the one non-windowed wall of our conservatory? And then there are the plants to cultivate and tend. Because, you know, if you’re going to have a light-flooded conservatory you’ve got to have some beautiful greenery in there. But making plants flourish (or even stay alive) is not my strong point.